We have a typical London garden meaning that it is scarcely bigger than a postage stamp, but it is outside, it is safe and it is ours and despite living in London, just a few minutes’ walk from a tube station it is strangely quiet. In fact, right now all I can hear are the birds singing and my children playing. It has to be said that all most people can hear are our children playing – sorry about that! Anyway the point is that the garden is small and we have a constant shall we move debate as a result, but we have a huge common and woodland just a couple of minutes away (again unusual when living in London). Where we live feels like a little village a lot of the time as long as you don’t stray down to the hectic main road. So we stay with our small garden and have had to be creative with developing ways to make a small garden fun for kids. Maximise space by building or buying a playhouse. Ours is elevated from the ground so that we could fit in a sandpit underneath and a place to store the bikes, which over time may be converted to a reading den. My husband designed and built this, which was a great deal cheaper than buying one, and the kids just love it. Build a den, get out some books and have a reading session. We take blankets and cushions to make our dens cosy. The den can be simple – just chairs and sheets. They don’t need anything complex. Our kids love it. 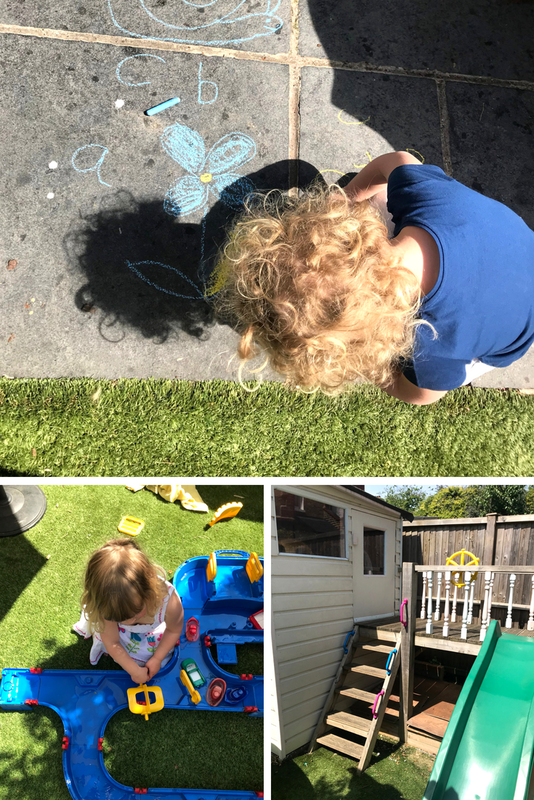 Bug Spotting – we have fake grass now so this is a bit trickier, but a recent caterpillar infestation did give them a great entertainment. I was less thrilled! What would I do if I had a bigger garden? If it was huge I would have a swimming pool. Dream, dream, dream, dream…. Mrs Mummy Harris also has a small garden and a great wish list which could be great ideas for those of you with bigger patches of lawn. 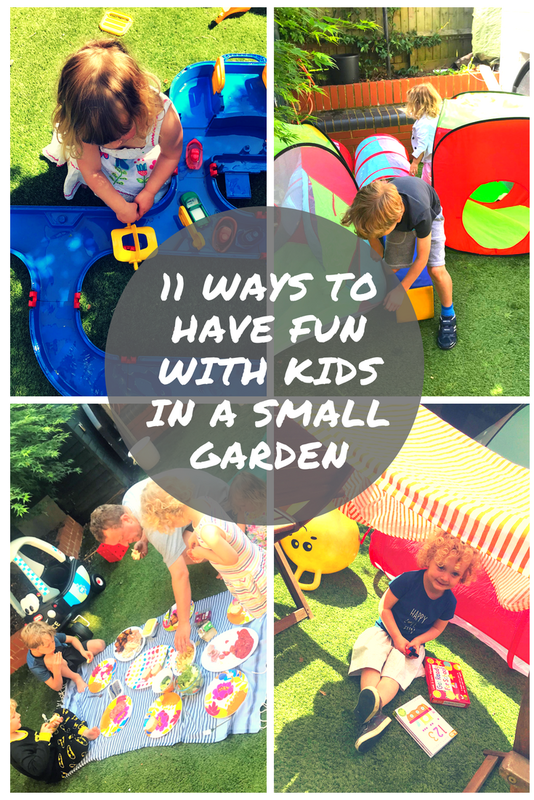 In the meantime I will look on the bright side; the great thing about a small garden is that it is easy to take care of so there is more time to be out there enjoying it and you can always see all the kids so you know what they are up too! Oh, I do love a silver lining…. 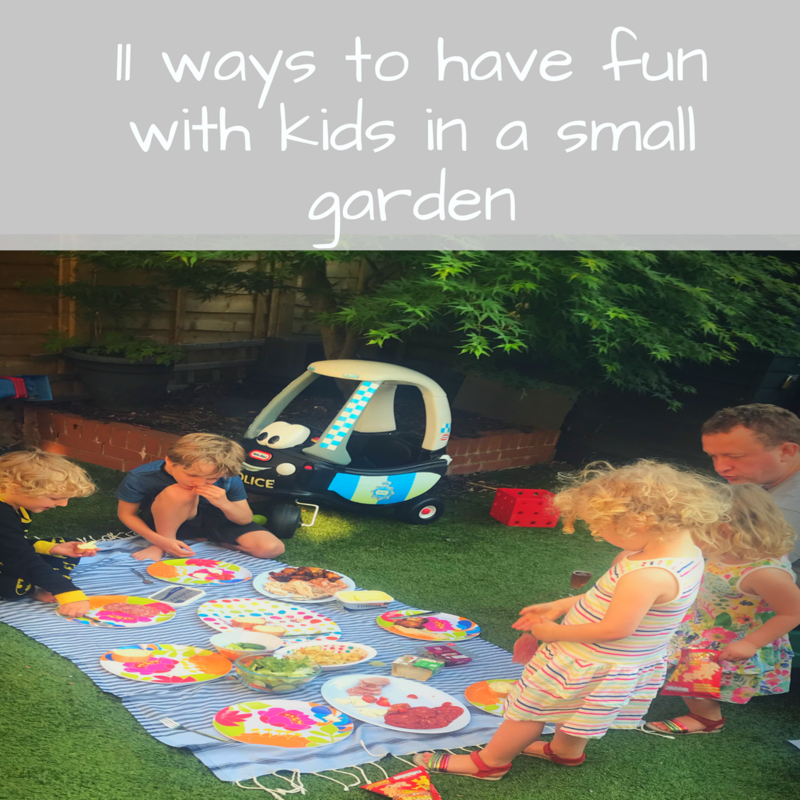 Looking at our garden, I would never have thought that four children could have been entertained in such a small space and yet in the holidays they spend hour upon hour out there. ← Hedrin Protect and Go Spray – The fight against Nits! Thanks Nita. Kids and water it is like match made in soggy heaven! Our playhouse remains a favourite. chalk drawing is a biggy (when its not raining!!) and the sandpit is right up there. we are getting to the stage when a decent trampoline is needed! None of which I had growing up as a kid !!!! Ross - the stented papa recently posted...Surviving the weekend without the Missus?! I only just recently heard of mud kitchens. Goodness knows how that has escaped me. We need one stat! I know they are fab. I keep meaning to go back to the post and add a link to the canal as honestly it is the best purchase we have made for the kids. Glad you enjoyed the post. My parents have an allotment and the kids just love it. Such a great way to get them engaged with what they are eating too. My kids love it when we are at my parents house and they get to pick their own veg for dinner!